Elegantly designed with a soft-touch thumb switch for easy and powerful steam release. 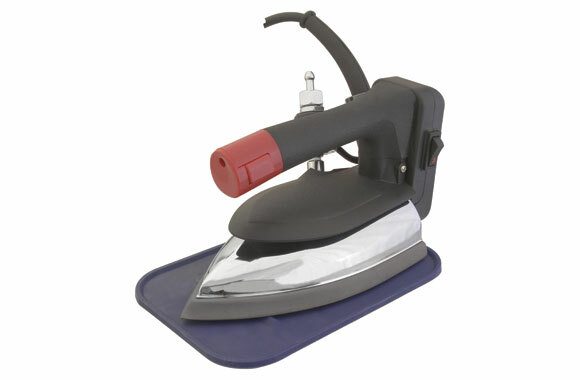 Features a specially designed heat shield and controls on the back of the iron. This high quality, industrial strength gravity feed bottle iron will prove to be very productive and efficient. Using the simplicity of gravity feed to provide the pressure which creates its own very dry, voluminous steam, the Sapporo® Gravity Feed Iron easily opens seams, flattens darts, sets pleats instantly, gives sharper creases and more. Easy To Use, the Sapporo® Gravity Feed Iron is extremely energy efficient and simple to maintain. Also, the built-in sheathed wire heater improves thermal efficiency, shortens heating time, and thus offers GREAT economy. Just pour the demineralizer (not included) into the water container and eliminate the need for distilled water! It is a rugged product, built to stand up to years of use, is user comfortable and its sleek design allows you to get to those hard-to-reach areas. Urethane Handle: Bio-engineered design for longer life. Convenient Switch: Only a slight touch will give you the proper amount of steam. Power Switch: Wireless power switch is easy to change if necessary. Steam & Heat Shield: Plate prevents heat & steam from being transmitted to your hands. * Unit weight is for product only, and does not include packaging. Quantity Orders can save you even more! Universal Sewing Supply's comprehensive Online Catalog can help you find up to date information on the endless inventory of products and supplies for the Sewn Products Industry. To add items to your cart, type a Quantity in the green box and click the Green Shopping Cart button. The quantity will automatically be added to your cart. To change the quantity of an item already in your cart, simply type the new quantity and click the Green Shopping Cart button. To remove an item from your cart simply type a 0 (zero) and click the Green Shopping Cart button. You can also change and remove a quantity for any item by clicking the My Cart button above to display all the items you've added to your cart. To add an item to your Default My Items folder, click the Add to My Items button displayed in the description box of each item. Any item added to your My Items Folder will remain in your Folder for future visits. To view and organize the items stored in your My Items Folder, simply click the My Items tab above.